Preheat oven to 425°F. Coat outside of chicken with 1-2 tablespoons olive oil, plus dried poultry seasoning, salt, pepper and zest of 1/2 lemon (reserve juice for later). Place all veggies and fresh herbs in the Bundt pan and drizzle with remaining olive oil and lemon juice. Sprinkle with additional salt and pepper if desired. Place all lemon slices except one on top of veggies. Cover hole in Bundt pan with a folded piece of aluminum foil. Place body cavity of the chicken over center cone of pan and press down so that it is snugly held in place. Place a few herb sprigs and the remaining lemon slice in the neck cavity. Bake at 425°F for 45 minutes or until internal temperature reaches 165°F. As wild as it may seem, cooking a whole chicken in a Bundt pan actually makes a whole lot of sense. For one, it’s incredibly efficient; roasting the chicken right side up is as close to rotisserie cooking as you can get. It cooks the chicken evenly on all sides. 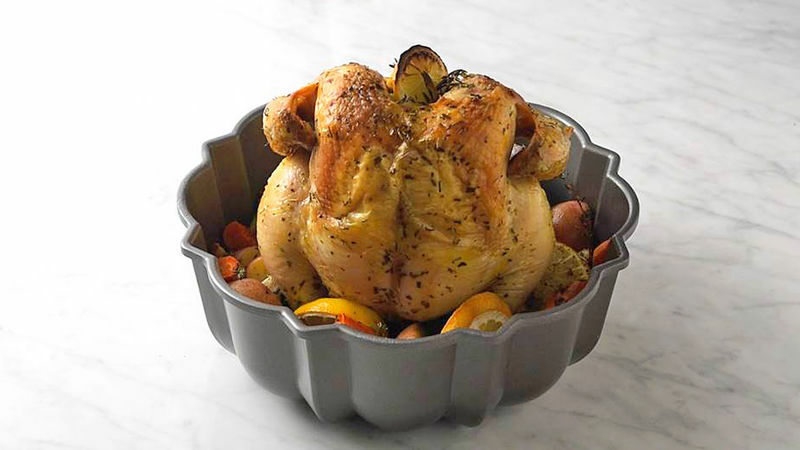 Beyond that, cooking a chicken in a Bundt pan is smart because the veggies resting beneath the chicken get infused with savory chicken drippings. And don’t even get us started on the fact that this Bundt pan chicken recipe only takes 60 minutes. It’s a well-rounded chicken dinner complete with vegetables all in one pan. Much like our other chicken recipes, you’ll find that the cook time is well worth the wait.